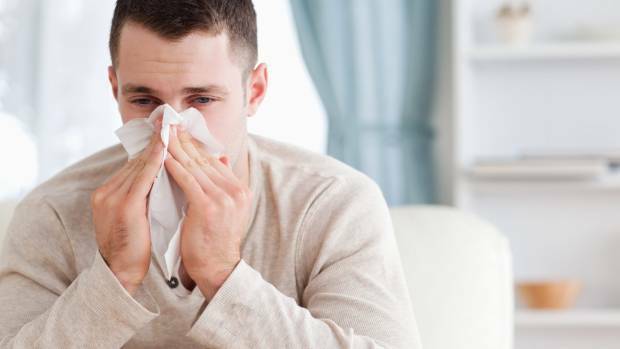 Common Cold or Seasonal Allergies - What's the difference? With many overlapping symptoms associated with both the common cold and seasonal allergies, it can be difficult to discern just what exactly is going on with your body. Whether you’re experiencing symptoms of a cold virus or allergies, Optimum Mens Health has you covered with treatment options. As you can see, both illnesses have similar presentations. Sometimes it takes an exam of the skin inside the nose (mucosa) to discern the difference. Most people can take over-the-counter (OTC) medications for either ailment. 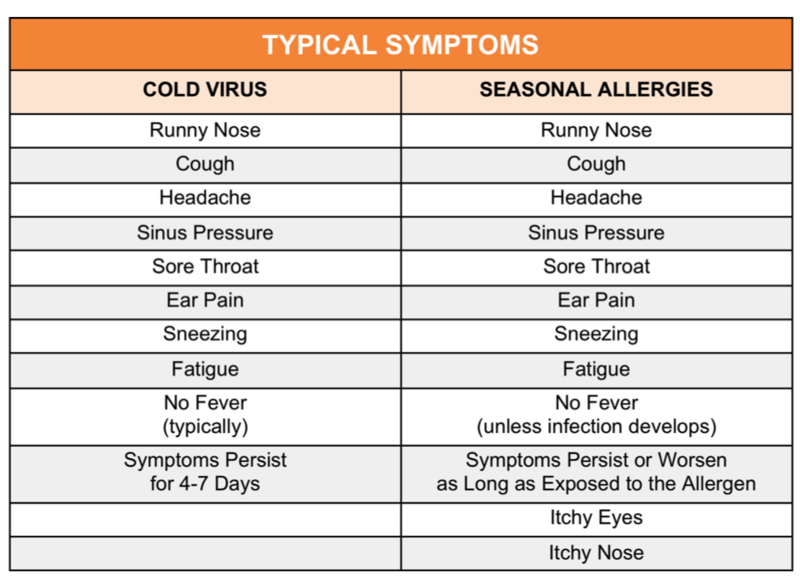 Generally, cold symptoms will subside within 4-5 days on onset, whereas the symptoms associated with seasonal allergies will persist or worsen over time. After 5 days with no response to OTC medications, an evaluation with your primary care provider may be in order to help treat your symptoms more effectively. There are no “cures” for cold viruses, but you can treat your symptoms to find a little relief while the virus runs its course. It’s best to treat your specific symptoms with medications like nasal decongestants, cough expectorants/suppressants, and pain relievers, such as Ibuprofen or Tylenol. You should also drink plenty of fluids while taking these medications and remember to get proper rest. Most colds never need antibiotics; they only need time. The body typically takes 5-7 days to naturally produce antibodies to defeat the virus. Ideally, you should begin taking medications one week before the start of your typical allergy season. It can take time for the medications to start working and prepare your system. Multiple oral medications exist to help relieve seasonal allergy symptoms, such as Claritin, Allegra, Zyrtec, Xyzal, and Benadryl, which are all in the same drug class and work by blocking histamines. Antihistamines are typically used for the initial treatment of allergies, and all of these medications are available OTC. The most common side effect is drowsiness with Claritin generally causing the least amount of drowsiness and Benadryl causing the most. However, individual results will vary, and you will have to decide which medication best suits you. The next treatment for allergies is intranasal steroids, such as Flonase and Nasonex. These medications are sprayed into the nose as a mist and are available OTC. These drugs belong to a class of medications called corticosteroids, which work by blocking the release of inflammatory chemicals released by the body in response to the allergen. This option is helpful in adjunct with antihistamines. The next class of oral medications includes leukotriene inhibitors, such as Singulair, which are available by prescription only. Leukotriene inhibitors work by blocking leukotrienes, which cause tightening of the airway muscles and production of excess mucus and fluid. Leukotrienes are inflammatory chemicals the body releases in response to allergens. People who prefer a more natural or homeopathic approach should consider the benefits of eating local honey. Ingesting just one teaspoon of local, raw, unprocessed honey a day can help improve allergy symptoms. When a person eats local honey, they are essentially eating local pollen and, over time, may become less sensitive to the allergens causing their symptoms. In addition to honey, using a Neti Pot on a daily basis, twice a day, especially during high pollen season, is very helpful at eliminating allergy symptoms. For some people, none of these treatments will be effective enough to alleviate symptoms. In these cases, an allergy specialist would be most beneficial. An allergist will perform blood work and skin testing to pinpoint the exact offending allergen(s) and create a treatment plan, which may include regular allergy shots, tailored to combating that particular allergen. While both colds and seasonal allergies can be annoying in the very least, they can also lead to complications that require further treatment. The opening to the sinuses (ostia) can become so inflamed that they block fluid drainage and can develop infection. Sinus infections can be prevented and treated with Neti pot use, nasal saline washing, nasal steroids (such as Flonase/ Fluticasone and Nasonex/Mometasone), and/or antibiotics. Post-nasal drip from colds or allergies can go down the back of the throat and cause inflammation, preventing the Eustachian tubes from draining properly. The build up of fluid can be a breeding ground for infection. Ear infections may be prevented by taking OTC cold medications to alleviate symptoms or by being proactive in taking allergy medicines as the season approaches. If an ear infection does develop, you can help treat the infection with decongestants and/or antibiotics and alleviate pain with OTC pain medications. So is it allergies or just a cold? In either case, there are treatment options available to help alleviate your suffering. Remember, if your symptoms persist or worsen, talk with your healthcare provider or give us a call at Optimum Mens Health to determine the course of action that’s right for you. Rachel Nall, Honey for Allergies. WebMD Medical Reference Reviewed by Melinda Ratini, DO, MS. Leukotriene Modifiers and Allergies.